Recently, in Singapore, MasterCard Worldwide, in collaboration with Standard Chartered Bank Singapore, unveiled Singapore’s first interactive payment card, or security token card, which uses MasterCard’s Display Card technology, announcing the next generation of payment cards. NagraID Security has manufactured a MasterCard Display Card which is similar in appearance to any other credit card, debit card or an ATM card, but the difference of the two cards are the LCD display and touch sensitive buttons which are meant for one time password (OTP). 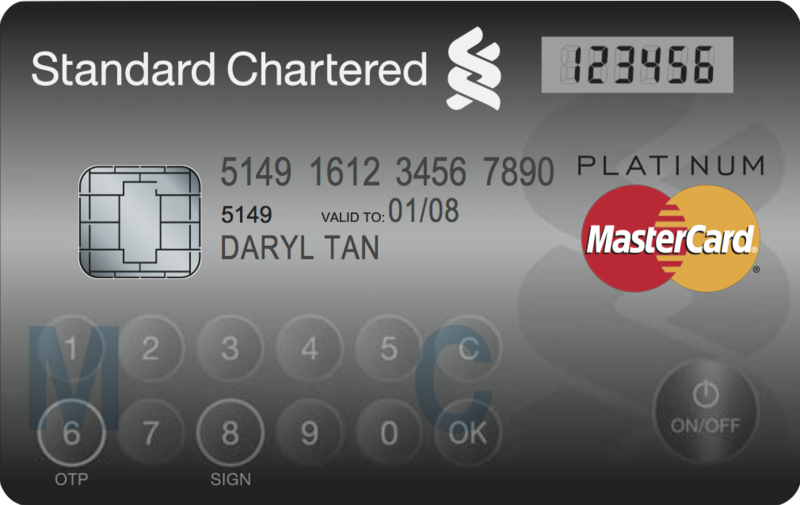 MasterCard’s Display Card Technology is disclosed by MasterCard in coactions with Standard Chartered Bank, Singapore. In near future, this Display Card could also comprehend features like recent transactions, credit balance, reward points and other useful information as well. Currently, the banks need a separate verification token. 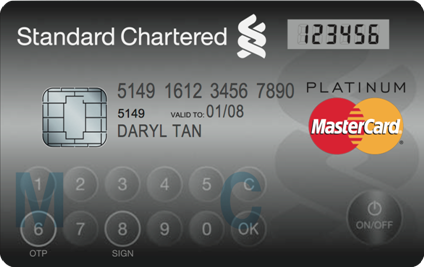 From January 2013, all Standard Chartered Banks will make its users a security token used for various transactions. Around the world, all innovative banks in collaboration with Standard Chartered Banks are shifting to Display Cards. Any debit card issued in Singapore will be a Display Card. The first Display Card was launched by MasterCard was in 2010. Display Cards are a combination of already established features on the payment card, with a small display and one or two buttons which are touch sensitive. A quick patent search reveals WIPO Patent Application WO/2012/009248 filed by Mastercard International Incorporated, which relates to systems and computer-based methods for using a one-time password (OTP) to authenticate an identity of a cardholder in a financial transaction. Another patent (US 8,095,113) filed by First Data Corporation (Greenwood Village, CO) discloses Onetime passwords for smart chip cards. As illustrated in FIG. 13A, the card holder’s name 1330 and an expiration date 1335 are shown on the front surface of the card, while a partial transaction account number 1315 is also provided on the front surface of the card. Digital display 1310 is also shown with a second portion of a transaction account number 1320 and a dynamic card verification value (dCVV) 1325. As described therein, the second portion of a transaction account number 1320 may be a password, and the second portion of a transaction account number 1320 and the dCVV may be calculated by a processor or IC chip. Moreover, the second portion of a transaction account number 1320 and the dCVV 1325 may change at set intervals of time. For example, the second portion of a transaction account number 1320 and the dCVV 1325 may change every four minutes. The description further provides another example, wherein the transaction card 1305 may include a switch, button or activation area that triggers the processor to provide or recalculate the second portion of a transaction account number 1320 and the dCVV 1325. 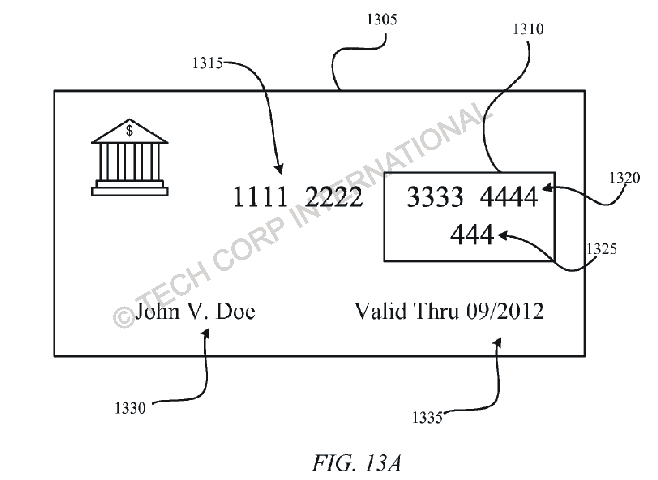 Although the ‘113 patent is not directly related to Mastercard’s Next Generation Display card, it still discloses a transaction card with a LCD technology that looks quite similar to Mastercard’s interactive payment card. Also, Mastercard and First Data are previously known to have various business associations with each other. Additionally, recent patent assignment records at US Patent Office reveal that the ‘113 patent is now assigned to Wells Fargo Bank. Patent Licensing: We assist in patent licensing by developing licensing strategies, managing licensing programs, applying required technical expertise for patent evaluation and reverse engineering, negotiating patent licensing terms, thereby bridging the gap between technological innovations and commercial markets. Patent Marketing: We plan and execute market investigation strategies, analyze patents, conduct patent searches for potential marketability, explore market applications, market analysis, developing commercialization strategy, targeting potential licensees, planning and proposing key contract terms. Technology Review: We review latest technology products, startups, new Internet products, digital innovations, tech news and aim to provide a quality resource to start-up companies, investors, technology companies and transactions. Funding & Investments: We make small investments, provide mentoring, consultancy, premier legal and accounting services, access to capital and work with the entrepreneurs to get their venture into the best possible shape for pitching to investors. Tech Corp International Consultants Pte. Ltd.is a Singapore based business consultancy company focusing on at entrepreneurs who are exploring to start a new business by incorporating a company in Singapore. Through a strong network of our business associates in Singapore, we provide a diverse range of services, including, Singapore company incorporation, accounting, tax, immigration and related compliance services. We assist our clients in incorporation of local Singapore companies, Singapore subsidiaries of foreign corporations and registration of Singapore branch offices of overseas companies, statutory administration of companies, accounting and tax filing for companies and individuals, application for work passes and permanent residence for expatriates, application for business licenses, and related corporate services.